Fill out some basic information about yourself, upload your photo, and write an attention-grabbing headline and essay along with your e-mail. Also fill in what you are seeking in the other person. This is absolutely free and you don't need to pay anything. Once inside our site, you can search our database for singles like you. Search by location, age, interests, and other personal preferences. Show Interest in other members by just clicking a button. All of this is free. When you decide that you are ready for more personal contact, simply upgrade to a Silver, Gold or Platinum Membership and communicate with thousands of members via IM, email, or chat. Membership fees range in price but can get as low as 25 cents a day - we think it's a small price to pay for love! 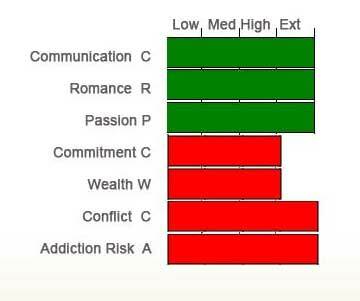 When you first go My Matches page you will immediately have access to our unique graph which accurately displays how you two measure up in terms of the four indicators F I R M (Friendship, Intimacy, Romance and Commitment). This is explained in detail under the heading Articles. When you want detailed analysis of the compatibility between any other memeber or even a celebrity (we have thousands of them in our database), you can check out our unique Synastry Graph and Astro Table. As yoiu mouseover, you will see the interpretation for all the differetn "aspects" between the two of you. You can also click on the Report which will give you an online detailed report on the screen or you can purchase an even more deatiled accurate report. These reports will definitely help you evaluate and make longterm decisions in your relationships. Synastry Graph and your Elements as it compares with your potential partner's. Here we find that Brad Pitt, who has much more Earth than Angelina Jolie (who has none!) provided her with stability and longterm security. Angelina Jolie has more Fire and gave him the push he needed to get married as well as to go around the world to satisfy her need for emotional security (more Water) and mothering instincts (Venus in Cancer) by adopting and having children. Interestingly, the conflict that shows in the graph below is offset by their acting as they even tried their best to bomb and kill each other in Mr. and Mrs. Jones!